Over the course of the next 24 hours, international news outlets will mindlessly report that the UK Parliament has "voted in favour/against a motion to recognise the State of Palestine". And that would be true, save for the fact that tonight's backbench business debate led by Grahame Morris MP is non-binding, and non-sensical. The anti-Semitic Labour MP, who is also the "chair" of the Labour Friends of Palestine group, has popped the following words down on a bit of paper, in his latest bid to change the world: "This House urges the government to recognise the State of Palestine alongside the State of Israel". Looks alright at first, doesn't it? Seems fair. Recognise one, recognise the other, right? There isn't even a unified Palestinian governance structure, and the Palestinian Authority is almost wholly reliant upon Israel for its administrative, financial, as well as security concerns. In other words, Palestine isn't a state. Unfortunately, this is flawed logic which Mr Morris perpetuates through his role as a "chair". Israel has passed the litmus test of a fully fledged sovereign state that deserves Western recognition. It is a functioning democracy, it has a robust judiciary, and manages (against all odds) to defend its sovereignty and can protect its own citizens. On the other hand – there isn't even a unified Palestinian governance structure, and the Palestinian Authority is almost wholly reliant upon Israel for its administrative, financial, as well as security concerns. In other words: Palestine isn't a state. It is so not a state, that in fact, every so often the leaders of the Palestinian Authority call up their pals in the globally recognised terrorist organisation Hamas, and say, "Hey, wanna do a deal?" This shouldn't just affect "Palestine's" position in the minds of British lawmakers, it should immediately take unilateral recognition of any state of Palestine off the table for the United Nations, and indeed any Western ally. But since the world lost its moral compass, this doesn't seem to matter. 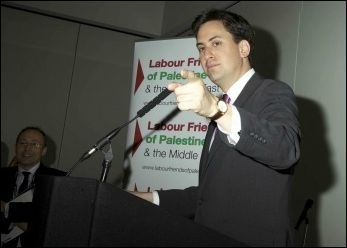 Now the only reason given for a rejection of a Palestinian state is "something something two state solution" – as is reflected by Ed Miliband's attempt to tame the Palestine-firster beast within his own party. The Labour leadership has begged Mr Morris to include the words, "contributing towards a negotiated settlement" – and it remains to be seen as to whether the Speaker will allow any amendments to the backbench business motion at 10pm tonight. But the fact that a large number of Labour MPs are presenting the original motion as a sign that the Labour Party is keen to unilaterally recognise a State of Palestine that doesn't actually exist is not the historic move in terms of foreign policy that they suggest, but rather, an historic indicator that Ed Miliband has truly lost control of his party. It's quite embarrassing actually. The Labour Party is three-line whipping the vote, but also telling front benchers who don't want to vote for a Palestinian State that they can and should steer clear of the Commons tonight. It has happened on domestic policy, and now, with his inability to support Britain's foreign policy geared towards a two-state solution (that won't be changed as a result of this vote), Ed Miliband has revealed that a Labour government would be one of constant internal strife. His failure to sit on the Labour Friends of Palestine "chair", and effectively have his party's foreign policy dictated to him from his backbenches, could be the straw that breaks Miliband's leadership. As far as his MPs will be concerned after tonight: it is open season on any and all wack-job policies they might be lobbied to believe. Raheem Kassam is a London-based writer and managing editor of BreitbartLondon.com. Kassam is the Larry and Brian Grodman Writing Fellow for the Middle East Forum, and an Associate Fellow at the Henry Jackson Society.